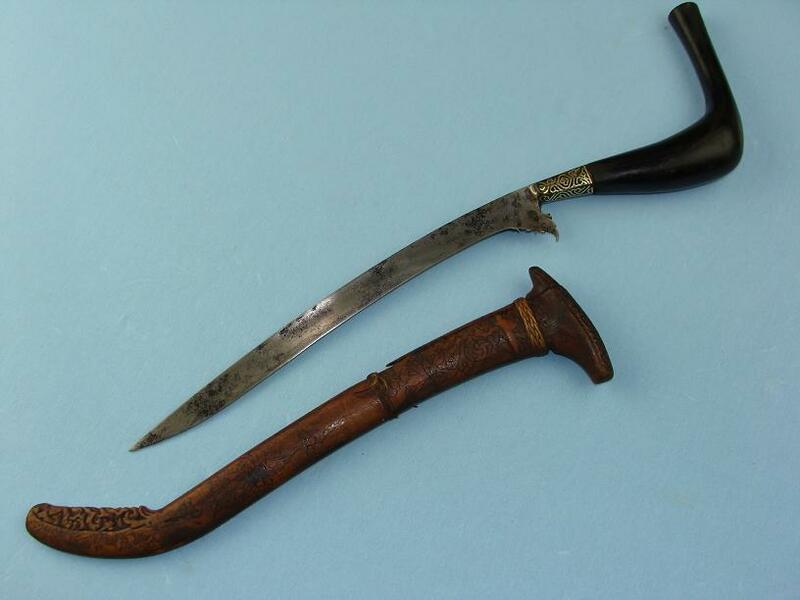 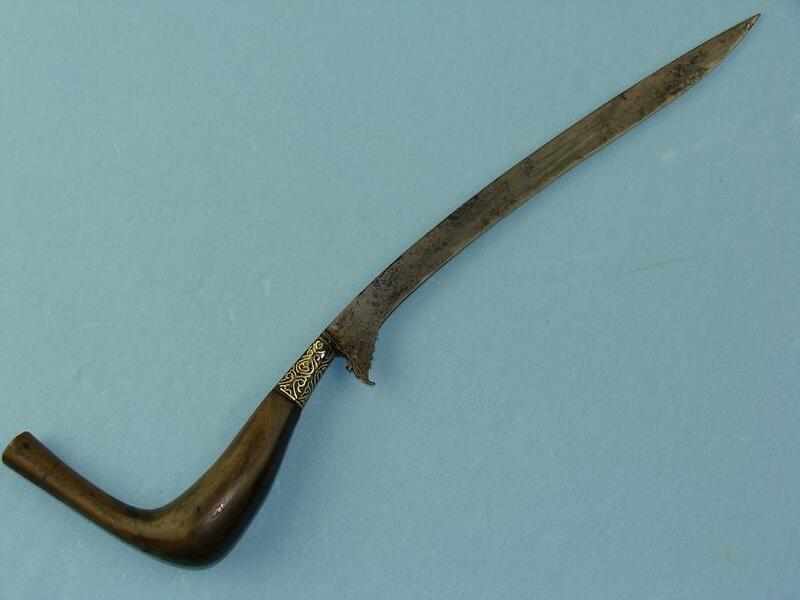 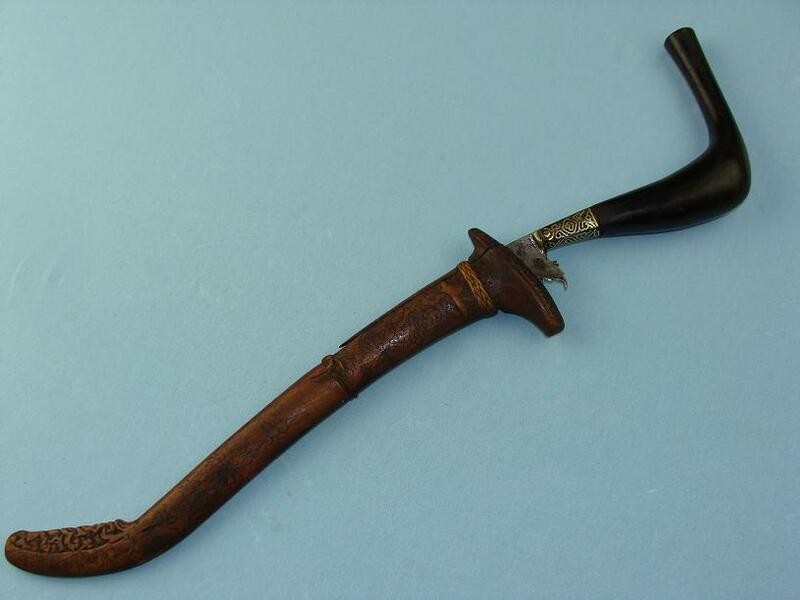 A stunning Rencong with gold mask inlay and an unusual scabbard variant, Kelling Hall collection. 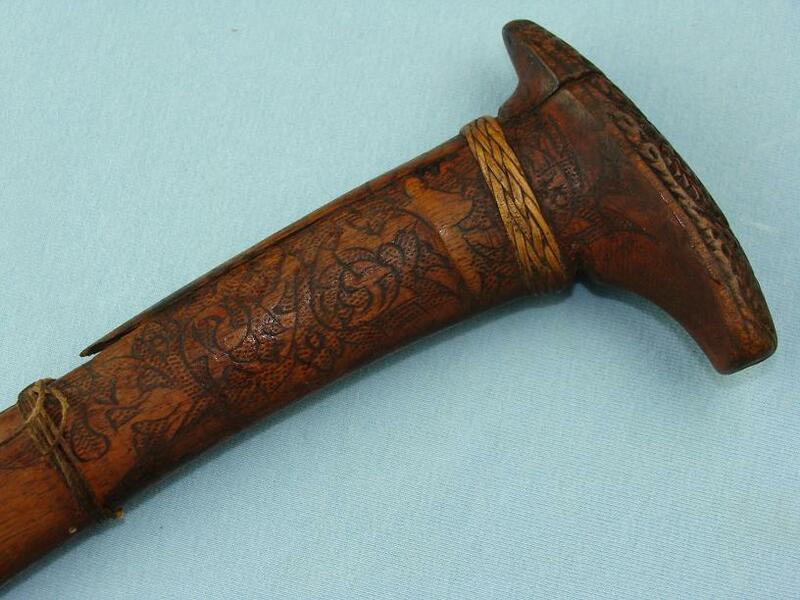 This stunning Rencong measures 43cms in the scabbard, 37cms out and excluding the bolster, the blade is 23cms. 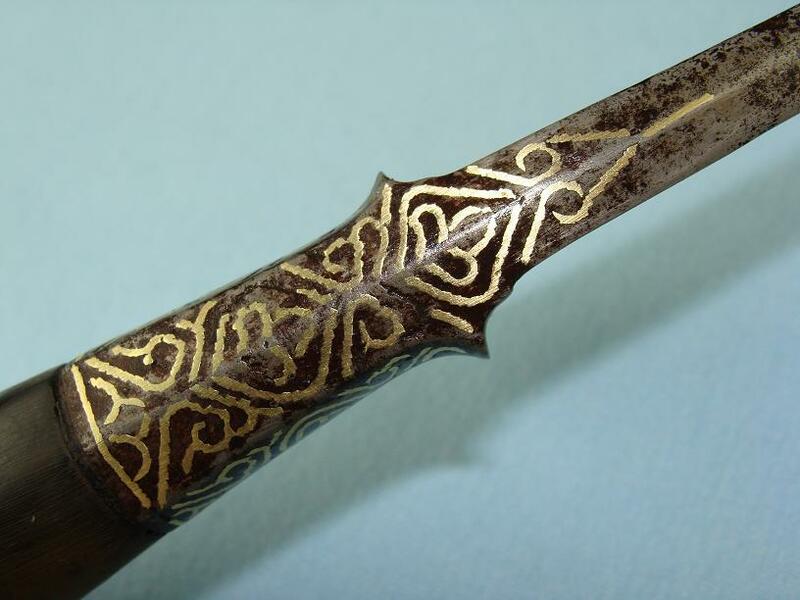 To all facets of the octagonal stem ring, partially along the spine and in the small lip of the stem ring, is gold inlay. 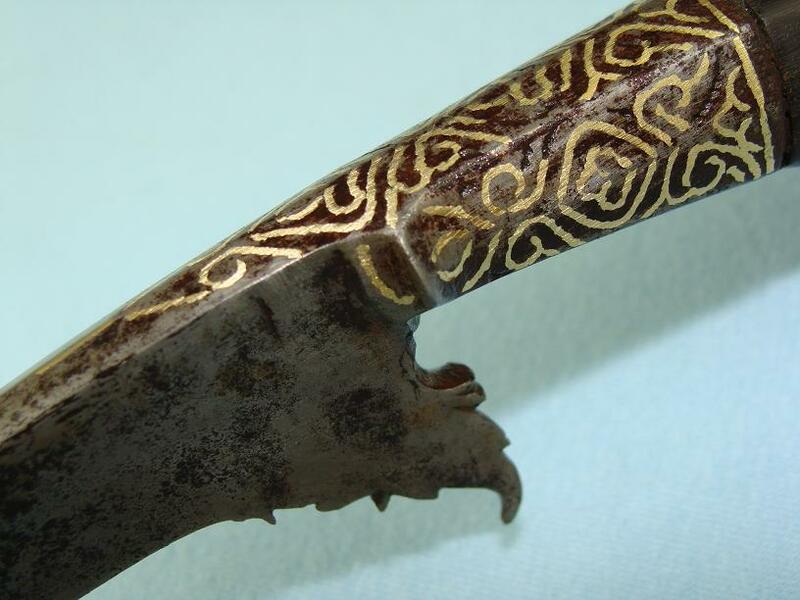 The inlay appears to be that of geometric masks. 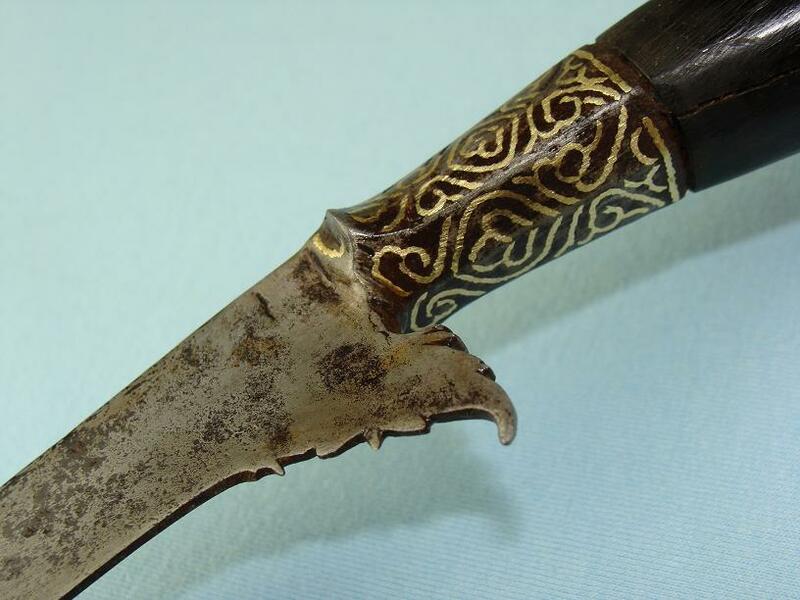 The blade has a very beautiful duru seuke that flows back towards the hilt. 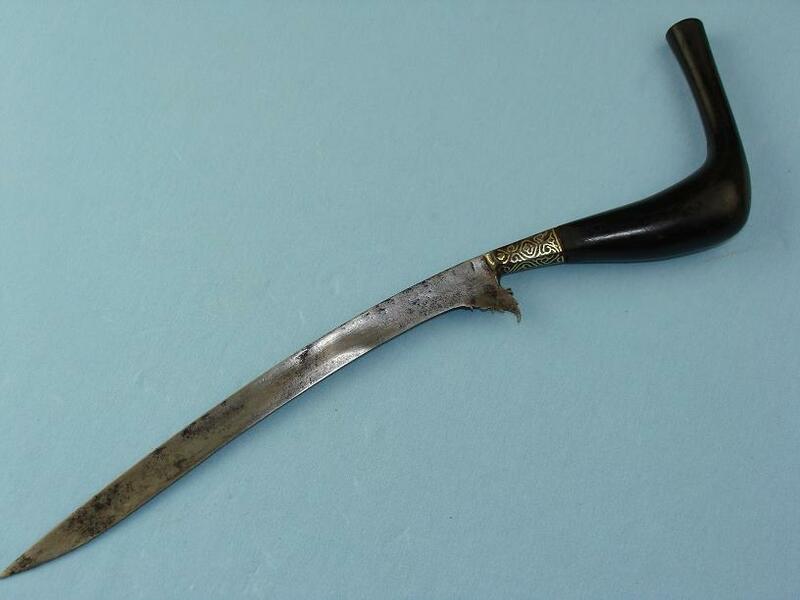 Just forward of the stem ring is 9mm and there is a hollow ground section flowing from the duru seuke up towards the spine and along the blade just below the spine for approx 15cms from the stem ring and the beveled cutting edge flows up to another hollow ground section near the tip of the blade. 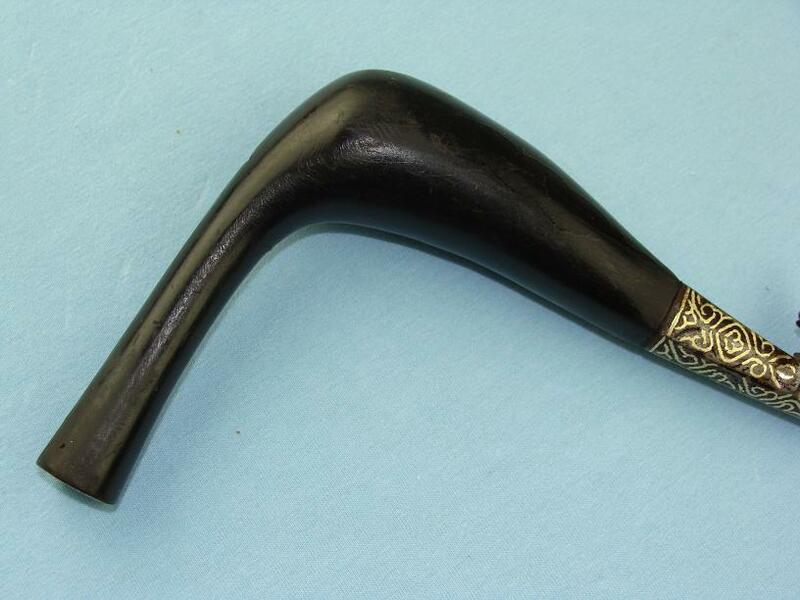 The Hilt is a beautiful one piece, two tone Hulu Meucangge type, being of black horn to one side and a green horn to the other side. 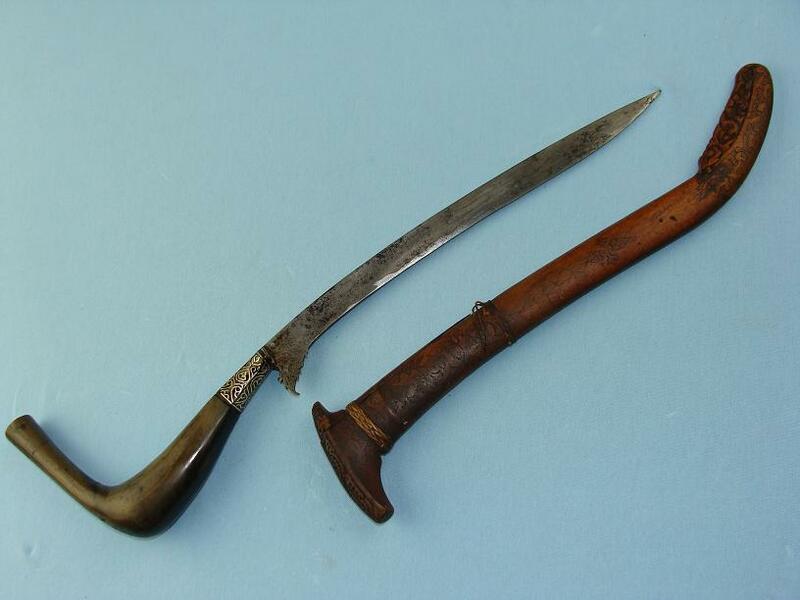 The scabbard shows two old working repairs, the first being old rattan binding to the top and the second being a string wrap to the middle. 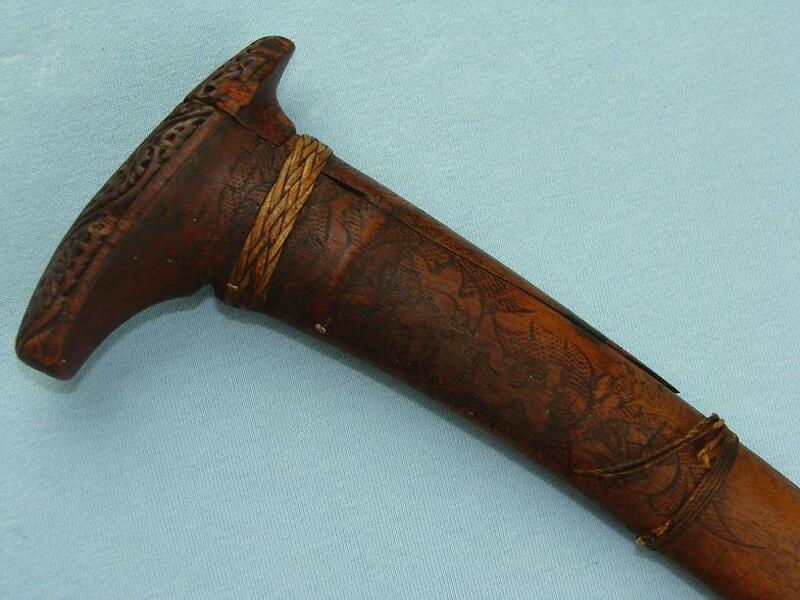 Floral design and carvings adorn the scabbard to both sides. 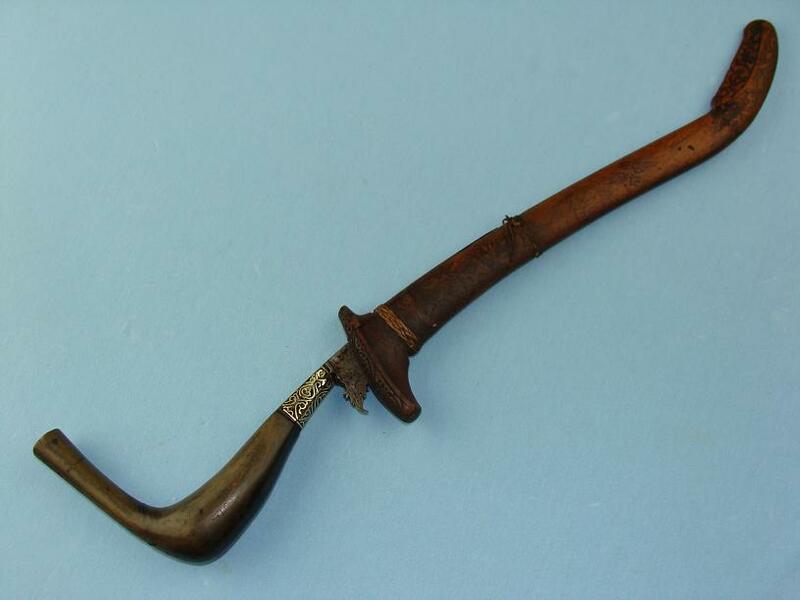 Of particular interest is the unusual scabbard throat that rises up and out at a pronounced angle rather than the more commonly seen slight, almost flat curve. 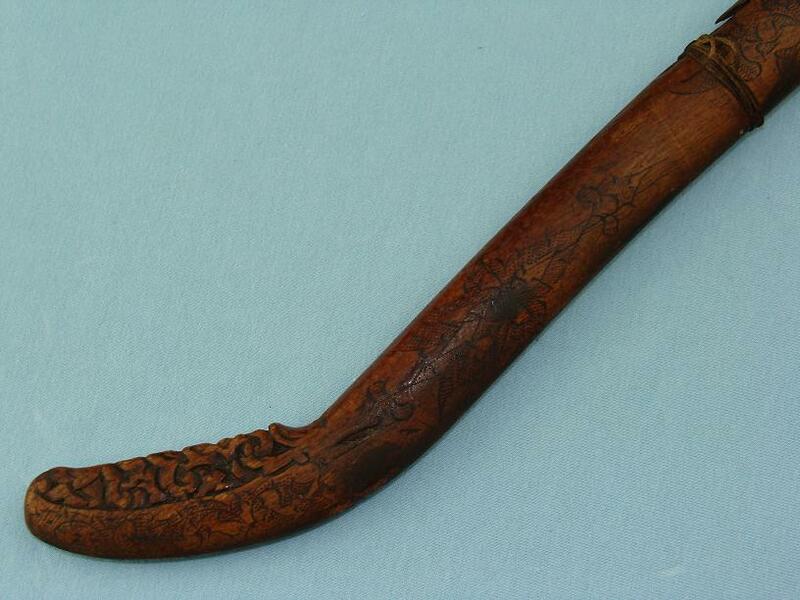 The scabbard mouth is also carved. 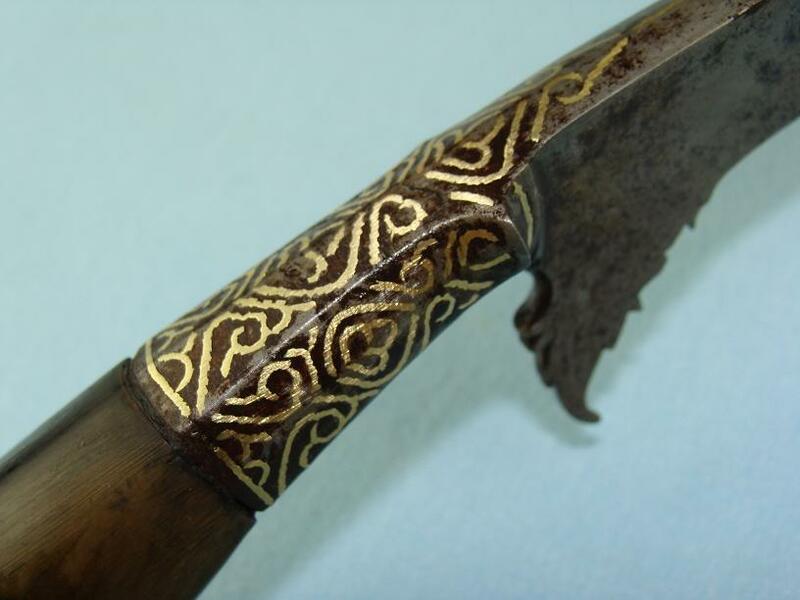 When sitting in the scabbard, where many Rencong sit mostly within, this piece sits proud with the duru seuke almost completely exposed and all the gold inlay is exposed. 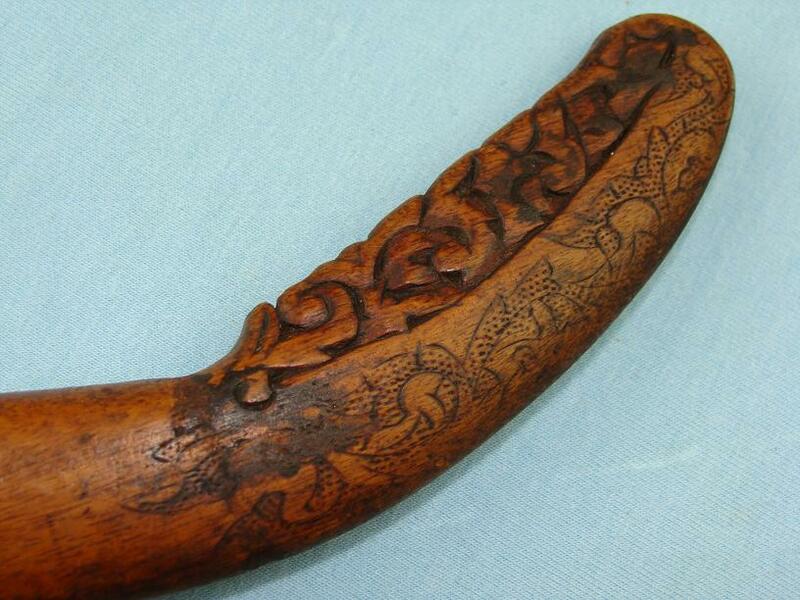 Certainly a Rencong of status and distinction that would have been worn proudly by the owner. 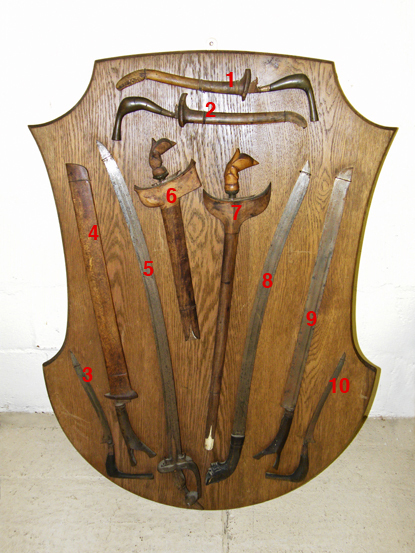 Please note, all items with the Gallery page are examples from my personal collections. 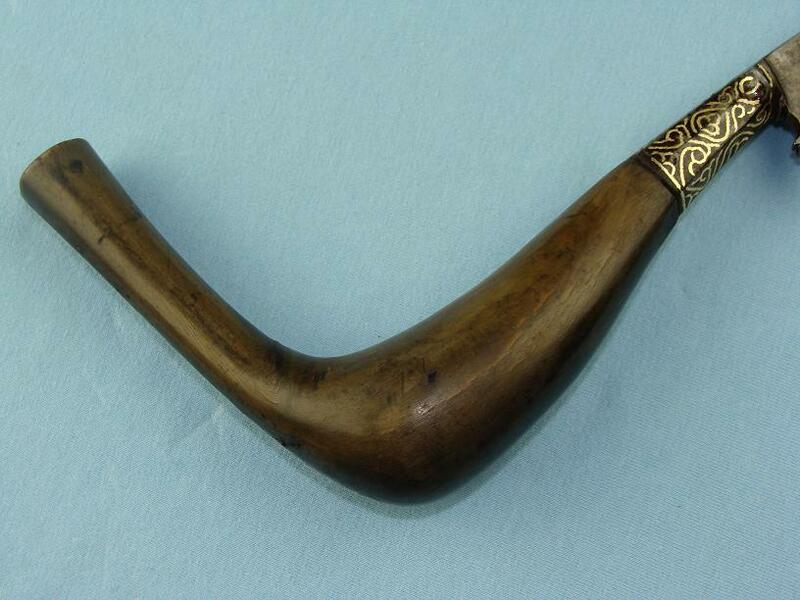 These items are not currently offered for sale but are sometimes released to the For Sale page as tastes and items vary.